Watch a preview, below, for the fourth and final season of the Star Wars Rebels TV show. Star Wars Rebels, season four, premieres on Disney XD on Monday, October 16, 2017 at 12:30am, 3:00am, 7:30am, 5:30am, and 9:00pm EDT. The Star Wars Rebels voice cast includes Freddie Prinze Jr. as Kanan, Vanessa Marshall as Hera, Steve Blum as Zeb, Tiya Sircar as Sabine, Taylor Gray as Ezra, Dee Bradley Baker as Captain Rex, David Oyelowo as Kallus, Forest Whitaker as Saw Gerrera, and Lars Mikkelsen as Grand Admiral Thrawn. Warwick Davis is joining the Disney XD series in its last installment, as Rukh, Admiral Thrawn’s assassin. Check out this Disney XD press release to learn more. The Emmy-nominated animated series “Star Wars Rebels” returns for its fourth and final season beginning MONDAY, OCTOBER 16 (12:30 a.m., 3:00 a.m., 7:30 a.m., 5:30 p.m. and 9:00 p.m. EDT), on Disney XD and the Disney XD App. The one-hour episode marks the beginning of the most important mission yet for the Ghost crew as the series draws closer to its grand finale. Before season four premieres, catch all the “Star Wars Rebels” episodes from season one through season three available anytime on the Disney XD App beginning THURSDAY, SEPTEMBER 28 (12:01 a.m. PDT). What do you think? 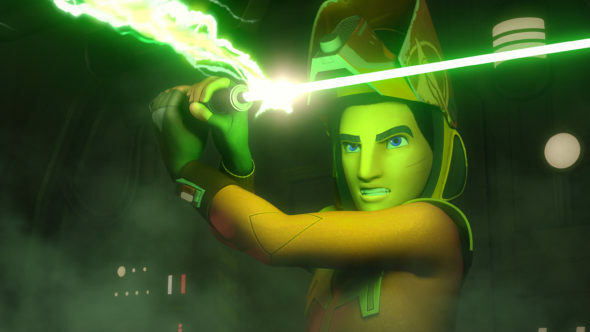 Are you a fan of the Star Wars Rebels TV series? Is it ending at the right time, or should Disney XD have renewed it for season five?